Congratulations to Pacific Northwest National Laboratory's Dr. L. Ruby Leung on her election as Fellow of the American Meteorological Society. The Society awards the distinction of Fellow to only two-tenths of one percent of its membership each year. Leung was cited for her outstanding individual contributions and leadership in the development and application of regional climate models. She will be recognized in January 2010 at the Society's 90th Annual Review and Fellows Awards in Atlanta, Georgia. Leung is a Laboratory Fellow in the PNNL Atmospheric Sciences and Global Change Division and a Fellow of the American Association for the Advancement of Science. In his nomination letter, Dr. Gerald R. North of Texas A&M University cited Leung's work in regional climate models, an impressive citation record, and her outstanding leadership role within the U.S. Department of Energy climate science community. In addition, he praised her leadership with the National Center for Atmospheric Research in advancing the Weather Research and Forecasting model for climate research, and in projects such as the North American Regional Climate Change Assessment Program, as demonstration of her prominence in the atmospheric and climate science community. 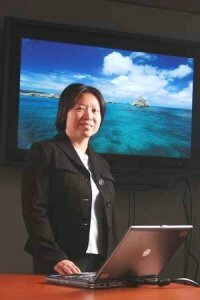 Leung is recognized in the international scientific community for her pioneering contributions in regional climate modeling and research on land-atmosphere interactions and their roles in climate variability and change. Her work on regional climate projections was included in scientific assessments done by the Intergovernmental Panel on Climate Change, which won the Nobel Peace Prize in 2007. In collaboration with the National Center for Atmospheric Research, Leung has been developing and applying advanced regional climate models that will help improve the predictions of climate change and its impacts. Her research on climate change effects has been featured in Science, Popular Science, The Wall Street Journal, National Public Radio, and many other major news outlets. The AMS, founded in 1919, has a membership of more than 14,000 professionals, professors, students, and weather enthusiasts. The AMS produces nine atmospheric and related oceanic and hydrologic journals, sponsors multiple annual conferences, and directs numerous education and outreach programs and services.